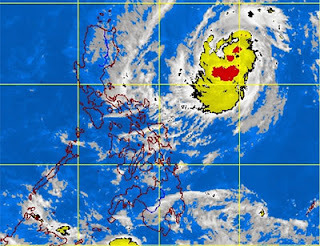 The Tropical Depression 'Vinta' has intensified into Storm and now located at east northeast of Virac, Catanduanes, according to PAGASA as of Wednesday, October 30, 2013. PAGASA weather bulletin as of 5 a.m. today, "Tropical Strom VINTA has maximum sustained winds of 65 kph and gustiness of up to 80 kph." VINTA was forecast continues moving Westward at 19 kph. PAGASA said, "by Thursday afternoon, Vinta will be 40 kilometers south of Sinait, Ilocos Sur." Three areas in LUZON listed below are now under public storm warning signal no. 1. PAGASA estimated the amount of rainfall is from 5.0 - 15.0 mm per hour (moderate - heavy) within the 500 km diameter of the Tropical Storm. For the meantime, please bookmark this page now or visit this site more often for you to be updated. You may also share this post to your friends so they may know about Tropical Storm Vinta. Comments or suggestions about "Tropical Storm Vinta - Bagyong Vinta Update 2013" is important to us, you may share it by using the comment box below.